The "Original E.F.I.E. 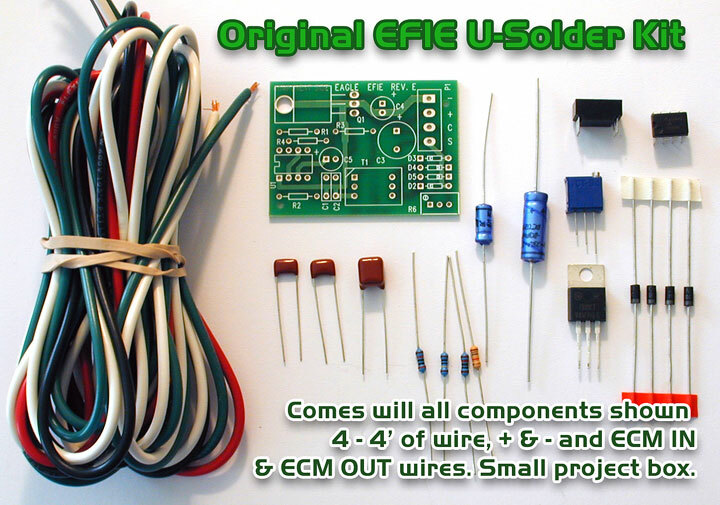 U Solder Kit " George Wiseman from Eagle Research coined the name " Electronic Fuel Injection Enhancer" EFIE circuit that is easy to install, should take just one or 2 hours for an experienced mechanic or car stereo installer. Longer time, for the laymen. The EFIE allows you to customize and 'correct' the voltage signal coming from your oxygen sensor; so that your computer doesn't know there is extra oxygen in the exhaust. Can also be purchased all soldered and tested as well, for those who do not solder or have the time. More installation and operating instructions are here. The EFIE alone can save 5% - 10% on your fuel bill, simply by 'leaning' your fuel mixture. We do not consider the EFIE to be a fuel saver on it's own. The EFIE is designed to be an ASSIST for fuel savers. We do not consider any technology to be a practical fuel saver unless it can save at least 25% on at least 75% of vehicles! This EFIE has been working for 20 years! THis EFIE replaces teh 18/1 EFIE we used to sell. Sorry The DEFIE is no longer available. The designer is no longer making them. We ship 5 days a week, only $6.10 for USPS Priority mail. 90% of the time we ship the next day after you order.